What with the fog and the 4 degree C temperature at 10.00 am we weren’t sure just how many sketchers would make it to our monthly outing today. 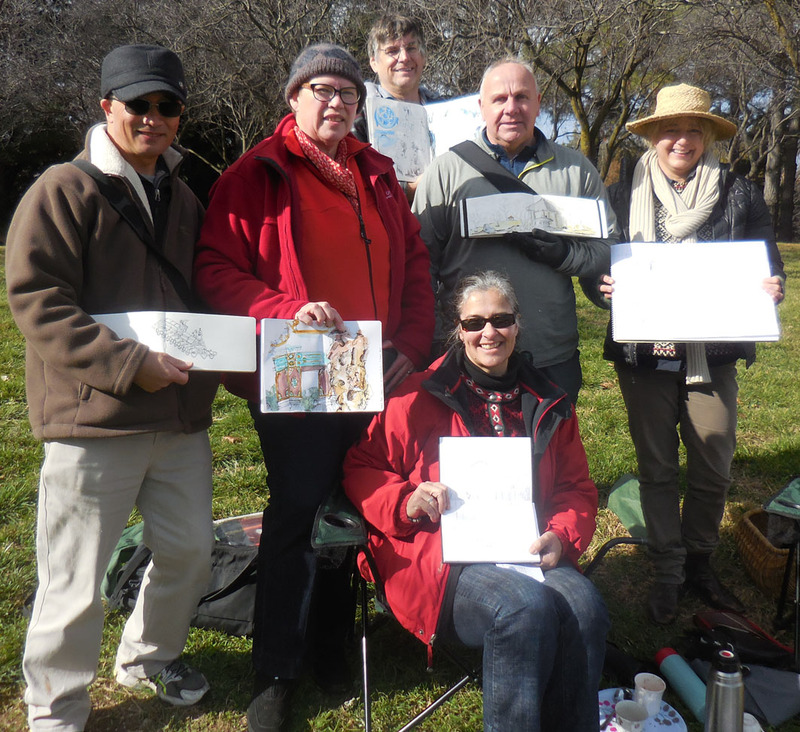 It turns out that Canberra’s sketchers are made of stern stuff, in all 9 people met to draw in the Canberra Beijing Garden on the shores of Lake Burley-Griffin. A gift of the city of Beijing to Canberra to mark our Centenary in 2013, the garden was completed late in 2014 and is starting to look quite settled. The garden displays some of the key aspects of Chinese garden culture, including an entrance gate, pavilion, sculptures and an ornamental stone. Several of us drew the bronze replica of the famous Eastern Han Dynasty sculpture, Galloping Horse on a Flying Swallow. The heavenly steed is at full pace with just one hoof touching down on the back of the flying bird. I liked the view from the front of the horse rather than the often seen side-on position. But from any angle this sculpture is a dynamic masterpiece of design. Further up the hill others were struggling with the tricky shapes of the Crane-Viewing Pavilion. 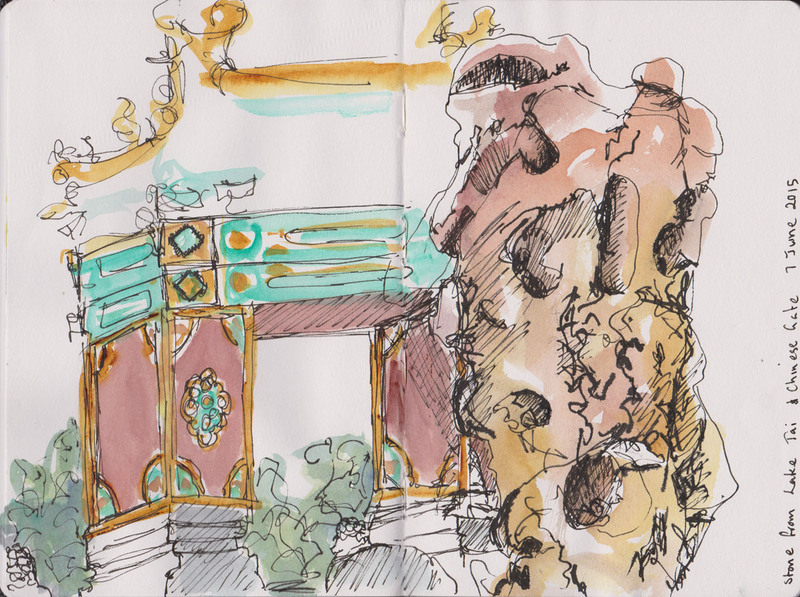 I opted to make a second sketch of the Entrance Gate, from below, looking past the Stone of Appreciation from Lake Tai. As always we gathered at the end to have a look at what had been drawn, discussing our various approaches and sharing tips. Sadly our scout had told us that our plan to have coffee in the nearby Hyatt Hotel wasn’t possible as it was jam-packed with Sunday brunchers. 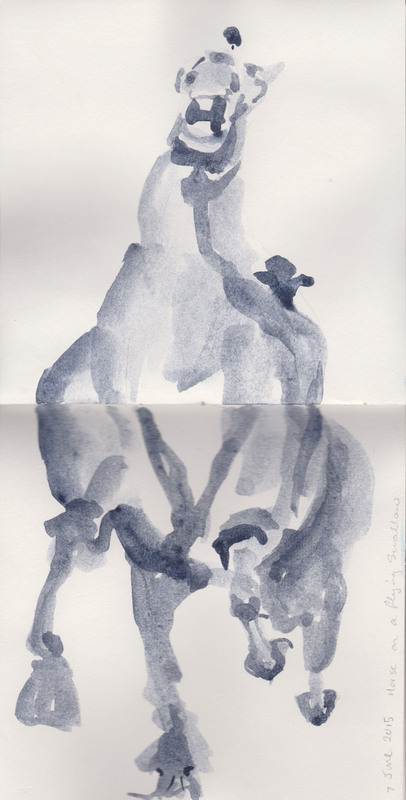 Thankfully one well prepared sketcher had brought along a fantastic carrot cake which they kindly shared with the rest of us – now that’s what I call an incentive!